(Nanowerk News) A nano-scale solar cell inspired by the coaxial cable offers greater efficiency than any previously designed nanotech thin film solar cell by resolving the "thick & thin" challenge inherent to capturing light and extracting current for solar power, Boston College researchers report in the current online edition of the journal Physica Status Solidi. The quest for high power conversion efficiency in most thin film solar cells has been hampered by competing optical and electronic constraints. A cell must be thick enough to collect a sufficient amount of light, yet it needs to be thin enough to extract current. 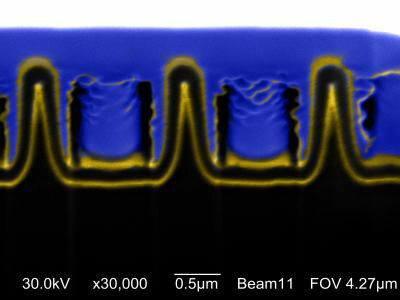 This image shows a cross section of an array of nanocoax structures, which prove to be thick enough to absorb a sufficient amount of light, yet thin enough to extract current with increased efficiency. Physicists at Boston College found a way to resolve the "thick & thin" challenge through a nanoscale solar architecture based on the coaxial cable, a radio technology concept that dates back to the first trans-Atlantic communications lines laid in the mid 1800s. "Many groups around the world are working on nanowire-type solar cells, most using crystalline semiconductors," said co-author Michael Naughton, a professor of physics at Boston College. "This nanocoax cell architecture, on the other hand, does not require crystalline materials, and therefore offers promise for lower-cost solar power with ultrathin absorbers. With continued optimization, efficiencies beyond anything achieved in conventional planar architectures may be possible, while using smaller quantities of less costly material." Optically, the so-called nanocoax stands thick enough to capture light, yet its architecture makes it thin enough to allow a more efficient extraction of current, the researchers report in PSS's Rapid Research Letters. This makes the nanocoax, invented at Boston College in 2005 and patented last year, a new platform for low cost, high efficiency solar power. Constructed with amorphous silicon, the nanocoax cells yielded power conversion efficiency in excess of 8 percent, which is higher than any nanostructured thin film solar cell to date, the team reported. The ultra-thin nature of the cells reduces the Staebler-Wronski light-induced degradation effect, a major problem with conventional solar cells of this type, according to the team, which included Boston College Professors of Physics Krzysztof Kempa and Zhifeng Ren, as well as BC students and collaborators from Solasta Inc., of Newton, Mass., and École Polytechnique Fédérale de Lausanne, Institute of Microengineering in Switzerland. The research was funded in part by a Technology Incubator grant from the Department of Energy.